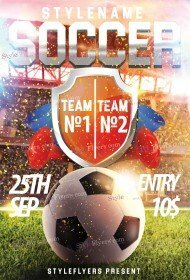 While you are thinking about the best promotion for your sport event, we have prepared the free Soccer flyer PSD templates listing where you can download for free any PSD sample for your soccer event. We care about all our clients so we try to implement our best ideas and create the best designs, which will satisfy any taste. In this category, you can get free soccer flyer template, which will become a great invitation for your sport event. After downloading any of our Photoshop files, you can start to customize it and bring it to the perfection. 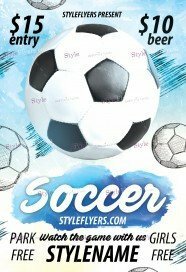 Our printable soccer flyer templates have the unique and creative appearance, which will provide you with the capacity crowd of visitors. 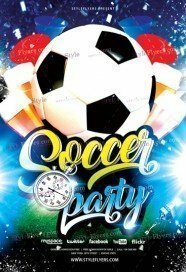 People love to attend any sport event, but of you want to stand out from others soccer match you will need to use a special Facebook cover for social media promotion. 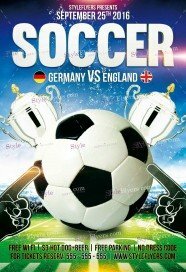 This tool will make your result more efficient and your event will become a real internet sensation. It doesn’t matter what type of flyer you are looking for, we can satisfy any needs. In our soccer category, you will find a great variety of different styles and designs which well-organized and fully layered structure.